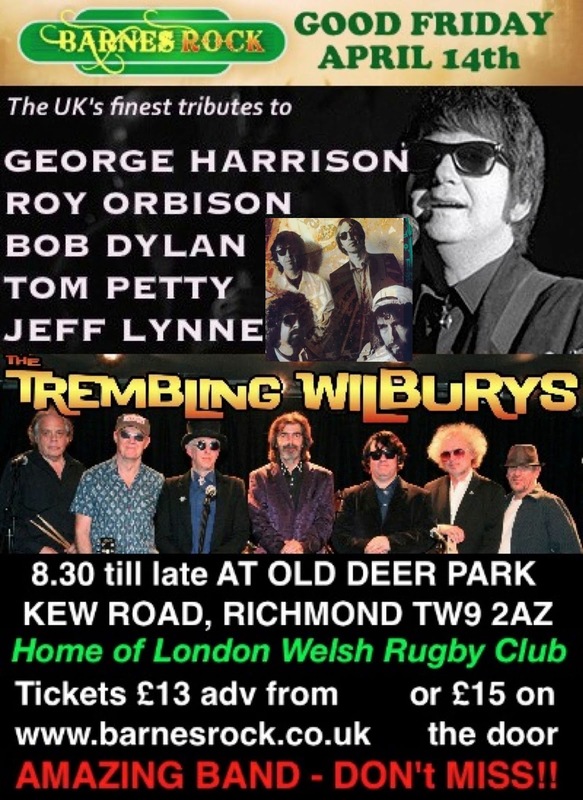 The Trembling Wilburys are playing a special Good Friday show on April 14th at London Welsh RFC in Richmond, Surrey. The guys also played it last Easter and had a great turnout including Mick Avory of the Kinks & Mike Berry. 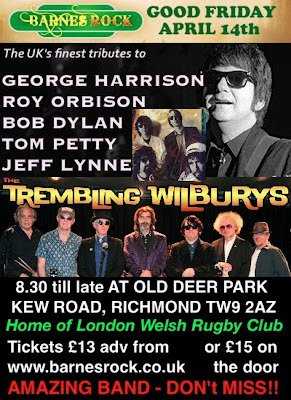 The Trembling Wilburys is the UK’s first and best tribute to rock supergroup the Traveling Wilburys, the amazing band formed in 1988 by George Harrison, Roy Orbison, Bob Dylan, Tom Petty and Jeff Lynne. This first-class band has wowed audiences around the South East and beyond for over five years with their musicianship, humour and infectious feel-good factor as they perform a selection of classic hits made famous by the individual members as well a selection of songs from the Traveling Wilburys' two albums. Band members include Glen Knowler as George Harrison, the closest look & sound-alike to the late Beatle in the world, while Dave Collison perfectly captures Roy Orbison‘s incredible vocal range and style. Andy McNish doubles as Bob Dylan & Tom Petty, while bassist Marko Laver plays Jeff Lynne including a couple of ELO classics. Completing the line-up are lead guitarist Dzal Martin, one of London’s most respected players; keyboard player Howard Robin aka "Ludwig van Wilbury"; and drummer Dave Stark who has played with many bands including the John Lennon Experience and on one occasion The Quarrymen, the band that became The Beatles. As well as performing at theatres and rock venues around the country the band has also played some prestigious events including the Heritage Foundation's Blue Plaque event for George Harrison and John Lennon at the old Apple building on Baker Street, as well as being regular guests at Beatles conventions both here and abroad. Other recent events include Blue Plaque lunches for drummer Tony Meehan of The Shadows as well as actors Burt Kwouk and Sir Alec Guinness. In fact every Trembling Wilburys show is an event which audiences cherish and remember for a long time afterwards. From Roy Orbison classics such as "Only The Lonely", "Crying" and "Pretty Woman" to Beatles hits like "Something", "Here Comes The Sun" and "While My Guitar Gently Weeps", to Dylan's "I'll Be Your Baby Tonight", Petty's "I Won't Back Down", Lynne's "Hold On Tight" and Wilburys classics "Handle With Care" & "En Of The Line", we guarantee you will be kept spellbound by this band's versatility and faithful renditions of so many memorable songs.